You have to give Bill de Blasio credit: when someone else forces his hand, he will immediately claim that he was on the more popular-seeming side all along. After other people brought up the idea of a bus turnaround, starting with shadow agencies like TransitCenter and continuing with his frontrunning successor Corey Johnson, the mayor released an action plan called Better Buses. The plan has a bold goal: to speed up buses to 16 km/h using stop consolidation and aggressive enforcement of bus priority. And yet, elements of the plan leave a bad taste in my mouth. The Better Buses plan asserts that the current average bus speed in New York is 8 miles per hour, and with the proposed treatments it will rise to 10. Unfortunately, the bus speed in New York is lower. The average according to the NTD is 7.05 miles per hour, or 11.35 km/h. This includes the Select Bus Service routes, whose average speed is actually a hair less than the New York City Transit average, since most of them are in more congested parts of the city. The source the report uses for the bus speed is an online feed that isn’t reliable; when I asked one of the bus planners while working on the Brooklyn route redesign, I was told the best source to use was the printed schedules, and those agree with the slower figures. In Brooklyn, the average bus speed based on the schedules is around 11 km/h. But the starting point for the speed treatment Eric Goldwyn and I recommended is actually somewhat lower, around 10.8 km/h, for two reasons: first, the busiest routes already have faster limited-stop overlays, and second, the redesign process itself reduces the average speed by pruning higher-speed lightly-used routes such as the B39 over the Williamsburg Bridge. The second reason is not a general fact of bus redesigns. In Barcelona, Nova Xarxa increased bus speeds by removing radial routes from the congested historic center of the city. However, in Brooklyn, the redesign marginally slows down the buses. While it does remove some service from the congested Downtown Brooklyn area, most of the pruning in is outlying areas, like the industrial nooks and crannies of Greenpoint and Williamsburg. Without having drawn maps, I would guess the effect in Queens should be marginal in either direction, for essentially the same set of reasons as in Brooklyn, but in the Bronx it should slow down the buses by pruning coverage routes in auto-oriented margins like Country Club. With all of the treatments Eric and I are proposing, the speed we are comfortable promising if our redesign is implemented as planned is 15 km/h and not 16 km/h. How does the plan compare with the speaker’s? For the most part, the mayor’s plan is less ambitious. The question of bus lanes is the most concerning. What Eric and I think the Brooklyn bus network should look like is about 350 km. Even excluding routes that already have bus lanes (like Utica) or that have so little congestion they don’t need bus lanes (like the Coney Island east-west route), this is about 300 km. Citywide this should be on the order of 1,000 km. At the speaker’s pace this is already too slow, taking about 20 years, but at the mayor’s, it will take multiple generations. The plan does bring up median lanes positively, which I appreciate: pp. 10-11 talk about center-running lanes in the context of the Bx6, which has boarding islands similar to those I have observed on Odengatan in Stockholm and Boulevard Montparnasse in Paris. Moreover, it suggests physically separated lanes, although the picture shown for the Bx6 involves a more obtrusive structure than the small raised curbs of Paris, Stockholm, and other European cities where I’ve seen such separation. Unfortunately, the list of tools on pp. 14-15 assumes bus lanes remain in or near the curb, talking about strategies for curb management. The mayor’s plan has a long list of examples of bus lane installation. These include some delicate cases, like Church Avenue. However, the most difficult, Nostrand, is entirely omitted. Nostrand Avenue carries the B44, the second busiest bus in the borough and fifth in the city. The street is only 24 meters wide and therefore runs one-way southbound north of Farragut Avenue, just north of the crossing with Flatbush Avenue and Brooklyn College. Northbound buses go on New York Avenue if they’re local or on Rogers if they’re SBS, each separated from Nostrand by about 250 meters. The argument for the split is that different demographics ride local and SBS buses, and they come from different sides of Nostrand. The subway is on Nostrand and so is the commerce. And yet, parking is more important to the city than a two-way bus lane on the street to permit riders to access the main throughfare of the area most efficiently. Moreover, even the bus lanes that the plan does discuss leave a lot to be desired. The second most important street in Brooklyn to equip with high-quality physically separated bus lanes, after Nostrand, is Church, like Nostrand a 24-meter street where something has to give. The plan trumpets its commitment to transit priority, and yet on Church it includes a short segment with curb lanes partly shared with delivery trucks using curb management. Limiting merchant complaints is more important to the mayor than making sure people can ride buses that are reliably faster than a fast walk. The mayor has recurrently prioritized the needs of people who are used to complaining at public meetings, who are typically more settled in the city, with a house and a car. New York may have a majority of its households car-free, but to many of them car ownership remains aspirational and so does home ownership, to the point that the transit-oriented lifestyle remains a marker of either poverty or youth, to be replaced with the suburban auto-oriented lifestyle as one achieves middle-class status. Even as there is cultural change and this mentality is increasingly not true, the city’s political system keeps a process that guarantees that millions of daily transit users must listen to drivers who complain that they have to park a block away. The plan has an ambitious number: 16 km/h. But when it comes to actually implementing it, it dithers. Its examples of bus lanes are half-measures. There’s no indication that the city is willing to overrule merchants who think they have a God-given right to the street that their transit-riding customers do not. Without this, bus lanes will remain an unenforced joke, and the vaunted speed improvements will be localized to too small a share of bus route-km to truly matter. The most optimistic take on Better Buses is that the mayor is signaling that he’s a complete nonentity when it comes to bus improvement, rather than an active obstacle. But more likely, the signal is that the mayor has heard that there are political and technical efforts to improve bus service in the city and he wants to pretend to participate in them while doing nothing. New York’s high construction costs are not just a problem for public transit. Roads exhibit the exact same problem. Case in point: replacing 2.5 km of the deteriorating Brooklyn-Queens Expressway (BQE) in Brooklyn Heights is slated to cost $3-4 billion, take 6-8 years, and require temporarily closing the pedestrian promenade supported on top of the highway. This is not even a tunnel – some local NIMBYs have proposed one in order to reduce the impact of construction, but the cost would then be even higher. No: the projected cost, around $1.5 billion per kilometer, is for an above-ground highway replacement. The section in question is between the Brooklyn-Battery Tunnel and the Brooklyn Bridge; the Promenade is the northern half of this section. There exist infrastructure projects that are worth it even at elevated cost. Second Avenue Subway Phase 1 cost $4.6 billion where it should have cost $700 million, but the expected ridership was very high, 200,000 per day, and so far ridership is on track to meet projections: the three new stations had a total of 138,000 boardings and alightings between them in 2017, and the revamped 63rd Street station went up by another 8,000. The BQE replacement is not such a project. Current traffic on the highway is stated as 153,000 vehicles per day, so on a per-vehicle basis it’s similar to Second Avenue Subway’s per-rider projection, around $23,000. But cars are not transit and cities need to understand that. The construction of a subway creates noise and traffic disruption, but once the subway is up, all of that is done. Even elevated trains cause limited problems if built properly from materials that minimize noise – the trains on the viaducts on the Paris Metro are less noisy than the cars on the street below. There are operating costs involved with subways, but fixed costs are so dominant that even in New York a busy line like Second Avenue Subway should be at worst revenue-neutral net of costs; for reference, in Vancouver the projection for the Broadway subway extension’s operating costs is well below the revenue from the projected extra ridership. Cars are not like that. They are noisy and polluting, and greenwashing them with a handful of expensive electric cars won’t change that. There are benefits to automobility, but the health hazards cancel out a lot of that. The Stern Review estimates the cost of unmitigated climate change at 20% of global GDP (e.g. PDF-p. 38), which in current terms approaches $500 per metric ton of CO2. The US has almost the same emissions intensity per dollar of production as the rest of the world; the negative impact of cars coming from climate change alone is comparable to the total private cost of transportation in the US, including buying the car, maintenance, fuel, etc. Now add car accidents, noise, and local air pollution. In a region where cars are an absolute lifeline, there’s a case for building connections. The costs are low since grading a road for medium speed with level crossings is not expensive. In cities, the situation is different. Drivers will grumble if the BQE is removed. They will not lose access to critical services. Is anyone proposing removing the BQE? Yes, there are some proposals to that effect, but they’re so far only made haltingly. Council Speaker and 2021 mayoral frontrunner Corey Johnson’s report on municipal control of the subway includes the following line: “Before spending $4 billion to reconstruct a 1.5 mile stretch of highway, the City should study alternatives to the reconstruction of this Robert Moses-era six lane road, including the removal of the BQE in its entirety.” The halting part here is that to study does not mean to enact; Johnson himself opposes repurposing car lanes for bus service in his own district. City Comptroller Scott Stringer, who has relied on a lot of the information I have brought up in this space in his reports, proposes to keep the BQE but only allow access to trucks. Bloomberg’s transportation commissioner Janette Sadik-Khan agrees with the idea and even pitches it as a brave alternative to the car. In other words, per the comptroller and former commissioner, billions of dollars are to be spent on the reconstruction of a somewhat narrower structure for 14,000 trucks per day. Stringer’s report even says that the comparable urban freeways that have been removed did not allow trucks in, which is incorrect for the Embarcadero Freeway in San Francisco and for the Voie Georges Pompidou in Paris (look for “camions” here). In reality, if closing the BQE means adding just 14,000 vehicles to surface streets, then it’s an almost unmitigated success of road dieting, since it means much less pollution and noise. The Regional Plan Association proposes its usual quarter-measures as well, sold under the guise of “reimagining.” It does not mention closure at all – it proposes rebuilding the structure with four lanes, down from the current six, and even dares to cite the closure in Paris as precedent. Everything in its analysis points out to the benefits of full closure and yet the RPA feels too institutional to propose that. Presumably if the RPA had opined on lynchings in the midcentury American South it would have proposed a plan to cut total lynchings by 25% and if it had opined on Fourth Republic-era colonialism in Algeria it would have proposed to cut the incidence of torture by a third while referencing the positive precedent of British decolonization in India. What should replace the BQE? The BQE should be removed all the way from the Brooklyn-Battery Tunnel to the Williamsburg Bridge. Its curves in Downtown Brooklyn with the loops to the Brooklyn and Manhattan Bridges consume valuable real estate, and farther east they divide neighborhoods. The new Navy Yard developments are disconnected from the rest of Brooklyn because of the BQE. Going east through Fort Greene, the BQE is flanked on both sides by Park Avenue. Buildings face the street, though many of the lots are empty or low-value. Thus, the surface streets have to stay. Selling what is now Park Avenue as parcels for residential and commercial development and mapping a street on the BQE’s 30-meter footprint is probably not viable. Instead, most of the footprint of the expressway should be parceled into lots and sold, converting Park Avenue into a one-way pair with streets about 12-15 meters in width each. East-west buses will continue running on Flushing and Myrtle, and north-south buses should probably not make stops at Park. In contrast, going south through South Brooklyn, buildings do not face the abutting surface street, Hicks. They present blank walls, as if it was midblock. This is a prime opportunity to narrow the street as if the highway has never been there, creating an avenue perhaps 20 or 30 meters in width. The wider figure is more appropriate if there are plans for bus lanes and bike lanes; otherwise, if buses stay on Columbia, 20 is better. In South Williamsburg, the road is nearly block-wide. The neighborhood is pro-development due to high birthrates among the Haredi population. Thus the footprint of the freeway must be used for private housing development. The area next to the Marcy Avenue subway station on the J/M/Z is especially desirable for the non-Haredi population, due to the proximity to Manhattan jobs. The city should retain an avenue-width roadway for Williamsburg Bridge access from the south, but beyond that it should restore the blocks of the neighborhood as they were before the BQE was built. If there’s a common thread to the various proposals by local politicians and shadow agencies (that is, the RPA), it’s an attempt at placemaking, defined to be any project that they can point to and say “I built that!”. A BQE rebuilt slightly narrower, or restricted to trucks, achieves that goal, with some greenwashing for what remains a waste of billions of dollars for motorist convenience. But the same can be said of a park, as in one architect’s proposal for the BQE. I can see a case for this in Brooklyn Heights, where the Promenade is an important neighborhood destination, but elsewhere, the case is extraordinarily weak. In South Brooklyn, the most important benefit of removing the BQE is easier pedestrian access to the waterfront; recreation space should go there. Fort Greene and the Navy Yard are both rich in parks; BQE removal makes the large parks on both sides of the motorway easier to access. And Williamsburg is hungry for private development, whether near the subway for Manhattan workers or elsewhere for Haredi families. Thirty years from now, nobody is going to walk on the remade street grid of South Williamsburg or the narrowed Hicks Street and wonder which politician set this up. But people may well notice the lower rents – and they may well notice them within a few years of the deconstruction of the road and the sale of the land for housing development. Ultimately city residents do notice if things are improving or deteriorating. It’s on the city to nudge infrastructure development in the direction of less pollution and fewer boondoggles. Two months ago, after my article about battery-electric buses appeared in CityLab, New Flyer reached out to me for an interview. Already in one of the interviews I’d done for the article, I heard second-hand that New Flyer was more reasonable than Proterra and BYD and was aware of the problem of battery drain in cold weather. I spoke to the company’s director of sustainable transportation, the mechanical engineer David Warren, and this confirmed what I’d been told. Most incredibly, I learned at the interview that the headline figures used in the US for electric bus performance explicitly exclude heating needs. The tests are done at the Altoona site and only look at electricity consumption for propulsion, not heating. New Flyer says that it is aware of this issue and has tried not to overpromise, but evidently Proterra and BYD both overpromise, and regardless of what any vendor says, American cities have bought into the hype. In Duluth this was only resolved with fuel-fired heaters; the buses only use electricity for propulsion, which is not the majority of their energy consumption in winter. Warren and I discussed New York specifically, as it has a trial there on the M42. The heater there puts out 22 kW of energy at the peak, but on the day we discussed, January 29th, when the air temperature was about -7*, actual consumption was on average about 10 kW. Electricity consumption split as 40% heating, 20% propulsion, and 40% other things, such as the kneeling system for easier boarding. The battery can last many roundtrips on the M42, specifically a very slow route. Electric vehicles tend to do much better then fuel-powered ones at low speed in city traffic, because of regenerative braking and higher efficiency. When I discussed the Proterra trial with MVTA, I was told specifically that the buses did really well on days when the temperature was above freezing, since the battery barely drained while the bus was sitting in rush hour Downtown Minneapolis traffic. This pattern is really a more extreme version of one that may be familiar to people who have compared fuel economy ratings for hybrid and conventional cars: hybrids are more fuel-efficient in city driving than on the highway, the opposite of a non-hybrid, because their electric acceleration and deceleration cycles allow them some of that regeneration. The current system is called OppCharge (“opportunity charging”), and currently requires the bus to spend 6 minutes out of every hour idling for recharge; the Xcelsior presentation shows a bus with a raised pantograph at a charging station, and I wonder whether it can be extended to an appropriate length of wire to enable in-motion charging. The New Flyer examples I have seen are in large cities – New York and Vancouver. New York’s system for opportunity charging does not require an attendant; Vancouver’s may or may not, but either way the charging is at a bus depot, where the logistics are simpler. In contrast, in Albuquerque the need for midday charging was a deal breaker. When I talked to someone who knew the situation of Albuquerque’s BRT line, ART, I was told that the BYD midday charge system would require an attendant as well as room for a charging depot. Perhaps an alternative system could get rid of the attendant, but the land for a bus that at the end of the day isn’t that busy has nontrivial cost even in Albuquerque. Even with opportunity charging, batteries remain hefty. Warren said that they weigh nearly 4 tons per standard-length bus; the XE40 weighs 14 metric tons, compared with 11.3 for the older diesel XD40 platform. Specifically on a short, high-ridership density like the M42 and many other New York buses, there is likely to be a case for installing trolleywire and using in-motion charging. In-motion charging doesn’t work well with grids, since it is ideally suited to when several branches interline to a long trunk route that can be electrified, but ultimately it’s a bus network with ridership density comparable to that of some big American light rail networks like Portland’s. *In case it’s unclear to irregular readers, I exclusively use metric units unless I mention otherwise, so this is -7 Celsius and not -7 Fahrenheit; the latter temperature would presumably drain the battery a lot faster. It is much harder to find estimates of construction costs for elevator access to metro stations than to find estimates for the costs of new tunnels. Accessibility isn’t as flashy, so it does not get reported in the international trade press. If you’re a humble blogger who has no idea what the Japanese phrases for “elevator,” “wheelchair accessibility,” and “construction costs” are, you have no way of figuring out how much it cost Tokyo to get its legacy subway network to be about 80-90% accessible. Thankfully, there are enough European cities where I do know those phrases that I do have a list. It comprises just eight cities, two in the US and six in Europe, and in at least one case (Milan) I don’t fully trust the numbers. New York:the current capital plan spends $740 million on 19 stations, and a single elevator is $10 million if I understand Curbed correctly. The headline figure is $39 million per station. Boston: MBTA head of systemwide accessibility, Laura Brelsford, told me that Symphony is a $25 million, 4 elevator project, and that Copley and Arlington were in the $30-40 million range each. I can’t find a link, unfortunately. London: here is a source saying a £76 million fund would make 12 stations step-free, but I don’t know which stations. This source states a higher figure, £200 million for 13 stations, which in PPP terms is about $22 million per station. The lower figure is only $9 million per station. Paris: nothing is accessible except M14 and the RER and there are no plans to make anything accessible, but a disability rights organization estimates the cost of making all 303 Metro stations accessible at €4-6 billion. Subtracting M14-only stations this is also about $22 million per station at the midpoint. Madrid: a 2016-20 plan breaks down costs per station. They’re about €5 million per station per line it serves (so a 3-line transfer is €15 million), and a single elevator is €1.5 million. The relevant numbers are on PDF-pp. 12-17. This document used to exist in English too but the URL broke and the Web Archive doesn’t have it. Lumping all remaining stations together, few of which are transfers, gives €531.9 million for 93 stations, or $7.5 million per station. Berlin: follow the link from my tweetstorm. The U-Bahn is about to complete step-free access by 2020. The cost is €800,000 per elevator, €2 million per station, or $2.6 million per station. Barcelona: I have three separate sets of numbers, and am placing the city on this list with the lower two. Here is a source describing the installation of elevators at 14 stations for €26.8 million. Here is a source describing a single station on a different line to be made accessible for €2.1 million. In contrast, a document describing the plan for universal accessibility states the cost up to 2009 at €390.97 million euros (PDF-p. 87) for 73 stations (PDF-p. 83). The first two sources average to $2.5 million per station, but the third one, covering more stations, including complex transfer points, averages $7 million per station in what I imagine are in 2009 prices. Milan: this article seems to be saying that elevator installation at 21 stations is budgeted at €24.5 million, all on Lines 1 and 2, which are shallow cut-and-cover lines built under narrow medieval streets. I’m not sure whether all of these are elevators, though – the Milan Metro site says that it has elevators at some stations and stairlifts at others. This totals $1.5 million per station. The low construction cost of elevator accessibility in Berlin is notable since the city’s tunneling costs are not so low. I am still trying to talk to local transit officials about this, but my surface understanding is that fewer elevators are needed per station. The city uses island platforms rather than side platforms and has shallow subsurface stations with access from raised street medians, so a single elevator covers the entire station. That said, Paris and New York both have extensive cut-and-cover construction under very wide streets, much like Berlin. A multiple of 2 over Berlin costs is to be expected as they have side platforms, and thus all station infrastructure needs to be doubled. However, Paris’s costs are (apparently) higher than Berlin’s by a factor of 9 and New York’s by a factor of 15. Paris is not a high-cost city when it comes to tunneling, and it’s possible that the activists just estimated it based on London costs, or that the government made up a high number in order to sandbag the calls for step-free accessibility. Yesterday, New York City Council speaker and frontrunner in the 2021 mayoral race Corey Johnson released a document outlining his plan to seek city control of the subway and buses. In addition to the governance questions involved in splitting the state-run MTA between a city-owned urban transit agency and state- or suburb-owned commuter rail, it talks about what Johnson intends to do to improve public transit, befitting a mayor in full control of subway and bus operations. There are a lot of excellent ideas there, but also some not so good ones and some that require further work or further analysis to be made good. Johnson proposes to spin the urban parts of the MTA into a new agency, called BAT, or Big Apple Transit. The rump-MTA will remain in control of suburban operations and keep MTA Capital Construction (p. 35), and there will be a shared headquarters. Some cooperation will remain, such as contributions toward cheaper in-city commuter rail fares, but there is no call for fully integrated fares and schedules: the recommendation “all trains and buses in the city will cost the same and transfers will be free” does not appear anywhere in the document. Johnson also proposes that the BAT board will be required to live in the city and use transit regularly. There is a serious problem today with senior managers and board members driving everywhere, and the requirement is intended to end this practice. Cynically, I might suggest that this requirement sounds reasonable in 2019 but would have been unthinkable until the 2000s and remains so in other American cities, even though it would be far more useful there and then; the off-peak frequency-ridership spiral is nowhere nearly as bad in New York as it is in Washington or Boston. One strong suggestion in this section involves appointing a mobility czar (p. 36), in charge of the NYC Department of Transportation as well as BAT. Given the importance of the subway, this czar would be in effect the new minister of transportation for the city, appointed by the mayor. Ultimately, this section tends toward the weaker side, because of a problem visible elsewhere in the report: all of the recommendations are based on internal analysis, with little to no knowledge of global best practices. Berlin has city-controlled transit in full fare union with Deutsche Bahn-run mainline rail, but there has been no attempt to learn how this could be implemented in New York. The only person in New York who I’ve seen display any interest in this example is Streetsblog’s David Meyer, who asked me how DB and Berlin’s BVG share revenue under the common umbrella of the Berlin Transport Association (or VBB); I did not know and although I’ve reached out to a local source with questions, I could not get the answer by his filing deadline. This is by far the weakest section in the proposal. The MTA funds itself in large part by debt; Johnson highlights the problem of mounting debt service, but his recommendations are weak. He does not tell New Yorkers the hard truth that if they can’t afford service today then they can’t afford it at debt maturity either. He talks about the need to “address debt” but refrains from offering anything that might inconvenience a taxpayer, a rider, or an employee (pp. 42-43), and offers a melange of narrow funding sources that are designed for maximum economic distortion and minimum visible inconvenience. In fact, he calls transit fares regressive (pp. 59, 61) and complains about century-long fare increases: real fares have risen by a factor of 2.1 since 1913 – but American GDP per capita has risen by a factor of 7.7, and operating costs have mostly risen in line with incomes. He brings up ways to reduce costs. In operations these involve negotiations with the unions; even though the report mentions that drivers get paid half-time for hours they’re not working between the morning and afternoon peaks (“swing shift,” p. 48), it does not recommend increasing off-peak service in order to provide more mobility at low marginal cost. There is no mention of two-person crews on the subway or of the low train operator efficiency compared with peer cities – New York City Transit train operators average 556 revenue hours per year, Berlin U-Bahn operators average 829. In capital construction the recommendations are a mixed bag of good and bad, taken from a not-great RPA report from a year ago. Like the RPA, Johnson recommends using more design-build, in flagrant violation of one of the rules set by global cost reduction leader Madrid. However, to his credit, Johnson zooms in on real problems with procurement and conflict resolution, including change orders (pp. 50-51), and mentions the problem of red tape as discussed in Brian Rosenthal’s article from the end of 2017. He suggests requiring that contractors qualify to bid, which is a pretty way of saying that contractors with a history of shoddy work should be blacklisted; I have heard the qualify-to-bid suggestion from some sporadic inside sources for years, alongside complaints that New York’s current bid-to-qualify system encourages either poor work or red tape discouraging good contractors. Unfortunately, there is no talk of awarding bids based on a combination of technical score and cost, rather than just cost. Overall the talk of cost is better than what I’ve seen from other politicians, who either say nothing or use high costs as an excuse to do nothing. But it has a long way to go before it can become a blueprint for reducing subway construction costs, especially given the other things Johnson proposes elsewhere in the document. Another mixed part of the document is the chapter about accessibility for people with disabilities. Johnson recounts the lack of elevators at most subway stations and the poor state of the bus network, featuring drivers who are often hostile to people in wheelchairs. However, while his analysis is solid, his recommendations aren’t. First of all, he says nothing of the cost of installing elevators on the subway. An MTA press release from last year states the cost of making five stations accessible as $200 million, of $40 million per station. This figure contrasts with that of Madrid, where a non-transfer station costs about €5 million to equip with elevators, and a transfer station costs about €5 million per line served (source, PDF-pp. 11-12). In Berlin, which is not a cheap city for subway construction, the figure is even lower: about €2 million per line served, with a single elevator costing just €800,000. And second, his proposal for finding money for station accessibility involves using the zoning code, forcing developers to pay for such upgrades. While this works in neighborhoods with ample redevelopment, not all city neighborhoods are desirable for developers right now, and there, money will have to come from elsewhere. For a document that stresses the importance of equality in planning, its proposals for how to scrounge funds can be remarkably inequitable. That said, in a later section, Johnson does call for installing bus shelters (p. 74). 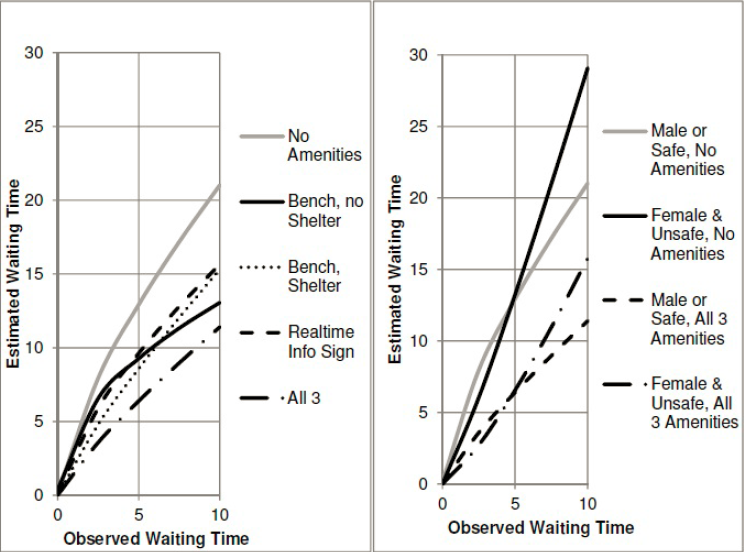 A paper referenced in a TransitCenter report he references, by Yingling Fan, Andrew Guthrie, and David Levinson, finds that the presence of shelter, a bench, and real-time arrival information has a large effect on passengers’ perceived wait times: in the absence of all three amenities, passengers perceive wait time as 2-2.5 times as long as it actually is, rising to a factor of almost 3 for 10-minute waits among women in unsafe areas, but in the presence of all three, the factor drops to around 1.3, and only 1.6 for long waits for women in unsafe areas. Unfortunately, as this aspect is discussed in the bus improvement section, there is no discussion of the positive effect shelter has on people with disabilities that do not require the use of a wheelchair, such as chronic pain conditions. I do appreciate that the speaker highlights the importance of accessibility and driver training – drivers often don’t even know how to operate a wheelchair lift (p. 63). But the solutions need to involve more than trying to find developers with enough of a profit margin to extract for elevators. Bus stops need shelter, benches, and ideally raised curbs, like the median Berlin tramway stations. And subway stations need elevators, and they need them at acceptable cost. By far this is the strongest part of the report. Johnson notes that bus ridership is falling, and recommends SBS as a low-cost solution. He does not stop at just making a skeletal light rail-like map of bus routes to be upgraded, unlike the Bloomberg and de Blasio administrations: he proposes sweeping citywide improvements. The call for bus shelter appears in this section as well. But the speaker goes beyond calling for bus shelters. He wants to accelerate the installation of bus lanes to at least 48 km (i.e. 30 miles) every year, with camera enforcement and physically-separated median lanes. The effect of such a program would be substantial. As far as I can tell, with large error bars caused by large ranges of elasticity estimates in the literature, the benefits in Eric Goldwyn’s and my bus redesign break down as 30% stop consolidation (less than its 60% share of bus speedup since it does involve making people walk longer), 30% bus lanes, 30% network redesign, 10% off-board fare collection. There is no mention of stop consolidation in the paper, but there is mention of route redesign, which Johnson wishes to implement in full by 2025. The MTA is in support of the redesign process, and allowing for integrated planning between NYCDOT and the MTA would improve the mutual support between bus schedules and the physical shape of the city’s major streets. Moreover, the report calls for transit signal priority, installed at the rate of at least 1,000 intersections per year. This is very aggressive: even at the average block spacing along avenues, about 80 meters, this is 80 kilometers per year, and at that of streets, it rises to 200+ km. Within a few years, every intersection in the city would get TSP. The effects would be substantial, and the only reason Eric’s and my proposal does not list them is that they are hard to quantify. In fact, this may be the first time an entire grid would be equipped with TSP; some research may be required to decide how to prioritize bus/bus conflicts at major junctions, based on transportation research as well as control theory, since conditional TSP is the only way to truly eliminate bus bunching. Reinforcing the point about dedicated lanes, the study calls for clawing back the space given to private parking and delivery. It explicitly calls for setting up truck routes and delivery zones in a later section (pp. 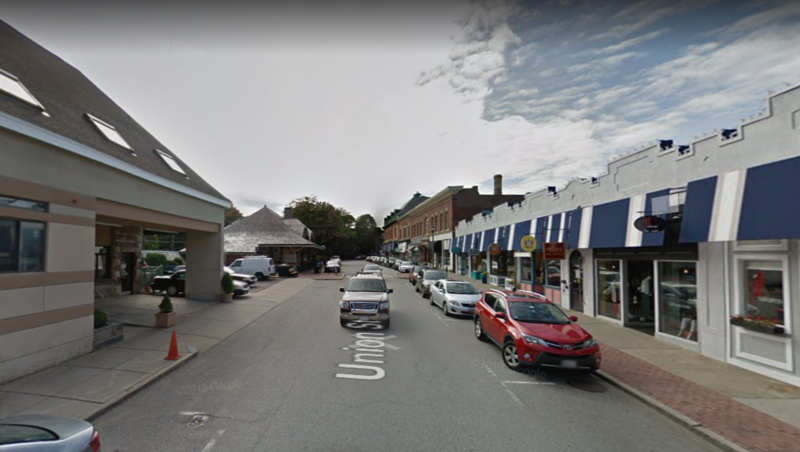 86-87); right now, the biggest complaint about bus lanes comes from loss of parking and the establishment of delivery zones in lieu of letting trucks stop anywhere on a block, and it is reassuring to see Johnson commit to prioritizing public transit users. This is another strong section, proposing pedestrian plazas all over the city, an expansion of bike lanes to the tune of 80 km (50 miles) a year with an eye toward creating a connected citywide bike lane network, and more bike share. If I have any criticism here, it’s that it isn’t really about city control of the MTA. The bus improvements section has the obvious tie-in to the fact that the buses are run by the MTA, and getting the MTA and NYCDOT on the same page would be useful. With bikes, I don’t quite understand the connection, beyond the fact that both are transportation. That said, the actual targets seem solid. Disconnected bike lane networks are not really useful. I would never bike on the current network in New York; I do not have a death wish. I wasn’t even willing to bike in Paris. Berlin is looking more enticing, and if I moved to Amsterdam I might well get a bike. The sections regarding costs require a lot of work. Overall, I get the impression that Johnson based his recommendations on what he’s seen in the local press, so the suggestions are internal to the city or occasionally domestic; the only international comparisons come from the RPA report or from Eric’s and my invocation of Barcelona’s bus redesign. This works for such questions as how to apportion the MTA’s debt service or how to redesign the bus network, but not so much for questions involving subway capital construction. New York has a large number of fluent Spanish speakers. It should have no problem learning what Spanish engineers know about construction costs, and the same is true for other communities that are well-represented in the cities, such as Korean-, Russian-, Chinese-, Brazilian-, and Polish-New Yorkers. Moreover, in most big cities that don’t send large communities to New York, such as those of Northern Europe, planners speak English. Johnson should not shy from using the expertise of people outside New York, ideally outside the United States, to get subway construction costs under control. The speaker’s plan is still a very good first step. The proposed surface improvements to buses, bikes, and street allocation are all solid, and should be the city’s consensus for how to move forward. What’s needed is something to tie all of this together with a plan to move forward for what remains the city’s most important transportation network: the subway. I am embarking on a long-term project to investigate why US construction costs are high using case studies, so everything I’m going to say so far is tentative. In particular, one of my favorite theories for most of this decade seems to be false based on the addition of just two or three new data points. That said, having spent the last nine years looking at topline costs and a few itemized breakdowns does let me reach some initial conclusions, ones that I believe are robust to new data. The context is that some mainstream American pundits are asking why, and I realized that I’ve written more posts criticizing incorrect explanations than posts focusing on more plausible reasons. These costs have some reinforcement with other projects in both cities. When New York built the 7 extension, there were calls for an intermediate stop in addition to the single stop built, and at the time the city definitively canceled the extra station, its cost was given as $800 million. Moreover, in Paris, another extension for which I have per-station cost data, that of Metro Line 12, costs €175 million for 2 stations and no tunnels, about $110 million per station, including overheads; the same is true of two more stations not on M12 given in a French report about the costs of Grand Paris Express (PDF-p. 10). The difference concerns construction methods. In Paris, as well as Athens, Madrid, Mexico City, Caracas, Santiago, Copenhagen, Budapest, and I imagine other cities for which I can’t find this information, metro stations are built cut-and-cover. While the tunnels between stations are bored, at higher cost than opening up the entire street, the stations themselves are dug top-down. This allows transporting construction materials from the top of the dig, right where they are needed, as well as easier access by the workers and removal of dirt and rock. There is extensive street disruption, for about 18 months in the case of Paris, but the merchants and residents get a subway station at the end of the works. In contrast, in New York, to prevent street disruption, Second Avenue Subway did not use any cut-and-cover. The tunnels between stations were bored, as in nearly all other cities in the world that build subways, and the stations were mined from within the bore, with just small vertical shafts for access. 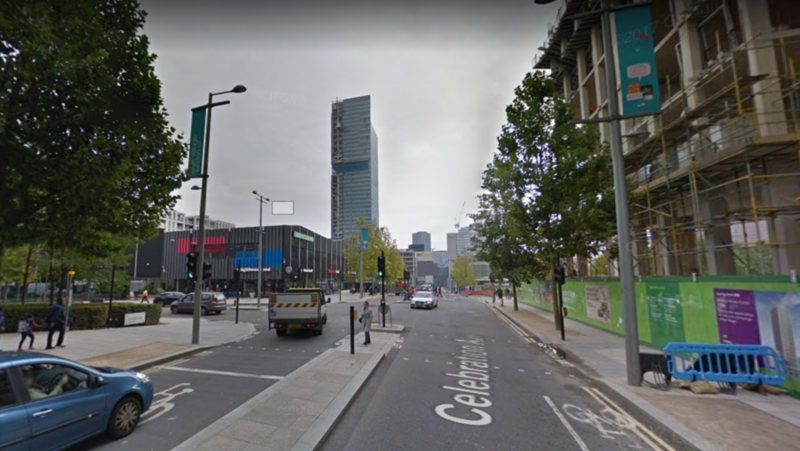 The result was a disaster: the costs exploded, as can be seen in the above comparison, and instead of 18 months of station box-size disruption, there were 5 years of city block-size disruption, narrowing sidewalks to just 2 meters (7′ to be exact). In London, the Crossrail project was forced to mine stations as well, as it passes underneath and around many older Underground lines. Only one station could be built cut-and-cover, Canary Wharf, built underwater at very deep level. These stations have comparable construction costs to those of Second Avenue Subway. One way around this problem is to build large-diameter bores, as in Barcelona on Line 9/10, which used a bore so big it could fit two tracks with platforms. However, L9/10 has high costs by Spanish standards, and moreover the vertical access to the stations is exclusively by elevator, with lower capacity than escalators and stairs. A technique for slant bores for escalators exists in St. Petersburg, but I do not know its cost. The other big problem with American metro construction methods is the oversized stations. This problem also occurs in Canada, where Toronto uses cut-and-cover stations like most of the world and yet has very high costs, as these cut-and-cover stations are palatial. But I do want to caution that this is a smaller problem than station mining, especially in New York. The total amount of excavation in Paris is barely lower than in New York. But whatever the dig size issue is, one problem persists: American subway stations have mezzanines, usually full-length. This problem goes back to the 1930s. According to a historical review published in JRTR, costs in New York per kilometer rose to $140 million in the 1930s; in the 1910s and 20s costs were only $45 million per kilometer but there was extensive elevated construction, so per underground kilometer they were perhaps $80 million. This contrasts with $30-35 million per km on lines built in London and Paris from the 1900s to the 1930s. A big cost driver in the 1930s was the higher construction standards. The subway built wider curves, even wider than those used in London and Paris. There were underground flying junctions allowing a complex system of branching on local and express trains to serve many different origin-destination pairs. And stations had full-length mezzanines. The mezzanines have since turned into an American standard, featuring on all subsequent subways that I know of. BART has them under Market Street. Boston has them at some of the newer stations, alongside high ceilings at parts of stations the mezzanines don’t reach. Outside the US, cities with such large station digs have high costs as well Toronto has had palatial construction at some of its newer stations, such as Vaughan Metro Center, leading to high costs even with cut-and-cover stations: while the Vaughan extension cost only C$320 million per kilometer, further projects in Toronto are slated to cost far more, including the single-stop Scarborough subway for C$520 million per km (only 18% less than Second Avenue Subway adjusted for station spacing) and the Downtown Relief Line at C$800 million per km. Moreover, my recollection of riding the MRT in Singapore, another high-cost country, is that its stations are palatial as well, more so than recent American ones, let alone French ones. Singapore has high construction costs: the under-construction Thomson Line is to cost S$600 million per km according to information from 2012, and since then there has been a schedule slip, though I can’t find more recent cost estimates, and I do know of rail infrastructure projects with schedule overruns that stay within budget. Individual stations in Singapore are fairly expensive, with the central one (Orchard) approaching American costs at S$500 million, and in a speech full of excuses for construction costs, Singaporean transport minister Khaw Boon Wan mentioned that the new line has more exits per station, signaling larger station footprints. The best industry practice, outlined by Madrid Metro’s Manuel Melis Maynar, is to award contracts by a combination of cost, construction speed, and a technical score judged by an in-house oversight team. Moreover, in Madrid there is separation between design and construction, in order to permit construction teams to make small changes as they go along without being wedded to their own plans. With this system, Melis built a wave of metros for an underground construction cost of, in today’s terms, $80 million per kilometer (almost all but not 100% underground), including rolling stock, which I have attempted to exclude from other lines whenever possible. The American practice is to award contracts by cost alone. This leads to one of two problems, depending on the coast. In California, the problem is, in two words, Tutor-Perini. This contractor underbids and then does shoddy work requiring change orders, litigated to the maximum. Ron Tutor’s dishonesty is well-known and goes back decades: in 1992 Los Angeles’s then-mayor Tom Bradley called him the change order king. And yet, he keeps getting contracts, all of which have large cost overruns, going over the amount the state or city would have paid had it awarded the contract to the second lowest bidder. In San Francisco, cost overrun battles involving Tutor-Perini led to a 40% cost overrun. This process repeated for high-speed rail: Tutor submitted lowest but technically worst bid, got the contract as price was weighted too high, and then demanded expensive changes. It speaks to California’s poor oversight of contractors that Tutor remains a contractor in good standing and has not been prosecuted for fraud. In New York, this is not a problem, as the state makes sure to avoid shoddy work through overexacting specs, down to specifying the materials to be used. Unfortunately, this kind of micromanagement reduces flexibility, increasing construction costs in two ways. First, the direct effect raises the hard costs of construction, by about 15-25% plus overheads and contingency according to many contractors interviewed for Brian Rosenthal’s New York Times article on the subject. And second, since many contractors are turned off by the red tape, there is less competition – the 7 extension had just a single bidder – and thus contractors can demand an extra profit on top. Some American cities try to get around this problem by using design-build contracts. However, these merely move the locus of micromanagement from the public to private sector. Madrid eschews them and prefers using public oversight to macromanage contractors. While this may well by the single most important institutional factor in New York, it is not universal in the United States. In Boston, a manager at the MBTA, Jaime Garmendia, reassured me that the agency would “would cease to do business with that contractor in a heartbeat” if anyone acted like Tutor. In Madrid, Melis Maynar insisted on itemizing construction contracts. Thus, every contract would have a pre-agreed cost per extra item if changes were needed. Since changes are inevitable, this provides fast conflict resolution without expensive courtroom battles and without too much risk on the contractor. I know of one additional example of itemization: in a paper studying electricity generation contracts in India, Nicholas Ryan compares cases in which there was a pre-agreed system for price escalation in case of changes in input prices and cases in which there were one-off negotiations whenever the situation suddenly changed. Pre-agreed escalation based on input prices leads to lower costs, first because there is less risk to the contractor, second because the negotiation happens in a situation in which if the contractor walks away the state can find another without incurring too much of a sunk cost, and third because the process attracts more honest contractors than Tutor. In the United States, itemizing does not happen. Contracts are by lump sum, and every time a change is needed, there is a new negotiation, which involves lawyers and potentially courtroom litigation. Robert Kagan calls this tradition adversarial legalism, and contrasts it with European bureaucratic legalism, in which regulators and judges have more power than individual lawyers. Kagan gives an example of litigation about the Oakland Harbor dredging project. Tellingly, a civil rights-centered critique of the concept, arguing that adversarial legalism produces more liberal outcomes for minorities and the disabled (in the context of special education) – but when it comes to transit, the United States lags in wheelchair accessibility. This is not intended as a broad attack on American legalism, although I do think such legalism also leads to worse infrastructure decisions in general. This is a specific attack on the tradition of using lawsuits to resolve conflicts between contractors and the state, rather than agreeing on itemized costs in advance, a technique that is legal in the US and that international firms, which have successfully bid on many American projects at American costs, are already familiar with. Some problems are not about procurement or the law, but purely about managerial competence. In Boston, consensus concerning the Green Line Extension seems to be that its high costs are the result of poor project management. The Green Line Extension’s costs were at one point estimated at $3 billion for 6.4 km of light rail in preexisting mainline rail rights-of-way; it’s so expensive that it was misclassified as a subway in one Spanish analysis, which still found it was a premium over European subways. The current estimate is down to $2.3 billion, of which $1.1 billion was wasted in the initial project, and only the remaining half is actual construction costs of the restarted project. Several Boston-area insiders, including the aforementioned Jaime Garmendia, explain that the MBTA had no prior experience in managing a large project, and did not hire an experienced manager for it, leading to a pileup of errors. When it finally hired a new manager and a new team and restarted the project, costs fell, but not before a billion dollars were wasted. The remaining cost of the extension, $190 million per km, is still very high for a light rail line. However, in conjunction with the other problems detailed here, this is not so surprising. There is little cooperation between different public transit providers in the US in the same region. Usually, the effect is only on operations. Whereas in Germany, Sweden, and Switzerland the fare within a metro area depends on the start and end point and perhaps on whether one rides in first or second class but not on whether one uses a bus, a tram, a subway, or a commuter rail line, in the United States fares are mode-dependent and transfers between separate agencies are not free. Nor do American agencies coordinate schedules between different modes of transit even within the same agency: the MBTA is forbidden to coordinate suburban bus and commuter rail schedules. While this by itself does not impact construction costs, it can lead to overbuilding when construction for one agency impinges on another agency’s turf. This problem is particularly acute when mainline rail is involved, as there is an institutional tradition of treating it as a separate fief from the rest of public transit: “commuter rail is commuter rail, it’s not public transit,” said MBTA then-general manager Frank DePaola in 2016. Extensive turf battles may also occur between different commuter rail operators run as separate units, for example in New York. The same tradition occurs in Canada, where Toronto regional rail modernization plans came from an overarching planning agency, which had to force the commuter rail engineers and managers to go along. I covered turf battles in a post from the end of 2017. In short, two distinct problems may occur. First, there may be visible overbuilding: for example, plans for California High-Speed Rail included a gratuitous tunnel in Millbrae, near the airport, in order to avoid reducing BART’s territory even though BART has three tracks at a station where it needs only one or at most two; overall, area advocate Clem Tillier found $2.7 billion in high-speed rail cost savings between San Francisco and just south of San Jose. The same problem afflicts plans for extra regional rail capacity in New York: the commuter railroads do not want to share turfs, forcing the construction of additional station tracks in Midtown Manhattan at great cost. The second problem is that without coordination of capital planning and operations, schedules for construction may be constrained. I believe that this contributes to the high cost of Boston’s Green Line Extension, which is high by American light rail standards. Without agreement on construction windows, right-of-way modifications such as moving bridge foundations to make room for extra tracks become difficult. There is a kind of overbuilding that comes not from American engineering practices that became accepted wisdom in the 1930s, but from active interference by politicians. I caution that I do not know of any case in which this has seriously impacted tunneling costs, the topic I feel more qualified to compare across the world. However, this has been a problem for other public transportation and livable streets projects, especially on the surface. When a city announces a new public transit initiative, it comes with the expectation of an infusion of money. Usually this money comes from outside sources, such as higher-level governments, but even when it is purely local, individual stakeholders may treat it as money coming from other parts of the city. In this environment, there is an incentive to demand extra scope in order to spend other people’s money on related but unnecessary priorities. The most common example of this is the demand for street reconstruction to be bundled with light rail and even bus rapid transit. The advocacy organization Light Rail Now claims that bundling street reconstruction has raised some American light rail costs. Moreover, I know examples of this happening for BRT. The Albuquerque project ART, which I covered in the context of electric buses, is one such example: it cost $135 million for 25 km, of which about 13 km were reconstructed to have wider sidewalks, trees, and street lighting. Moreover, in Tampa, the highway department insists that the transit agency find money for repaving roads with concrete if it wishes to run buses more frequently. This is not just an American problem: the Nice tramway, which at €64 million per km for the first line is France’s costliest, spent 30% of its budget not on the tramway itself but on drainage, rebuilding a public plaza, and other related but unnecessary amenities. Commuter rail exhibits this problem in droves. Either local suburbs or agencies that are captive to them insist on building large transit centers with plentiful parking, retail that is not necessary if trains arrive on time, and a sense of place. Spartan stations, equipped only with level boarding, shelter, and a convenient spot for connecting buses to drop people off on the street or at a bus bay, cost a few million dollars apiece in Boston and Philadelphia. In contrast, veritable palaces cost many tens of millions: the four stations of Penn Station Access, in the low-car-ownership Bronx, are projected to cost a total of $188 million per the 2015-9 capital plan (PDF-p. 225); in West Haven, an infill station cost $105 million including land acquisition. Politicians in the United States do not have an incentives to control costs. On the contrary, if anyone complains, their incentives are to accommodate even if costs rise as a result. While the American legal system favors the state over the individual in property takings, for example in contrast with the Japanese system, the political system favors NIMBYs and really anyone who complains. Infrastructure construction takes a long time and the politician who gets credit for it is rarely the one who started it, whereas complaints happen early. This can lead to many of the above-named problems, especially overbuilding, such as tunneling where elevated segments would be fine or letting agency turf battles and irrelevant demands dictate project scope. Politicians have the ability to remove obstructive officials, as Governor Andrew Cuomo did when LIRR head Helena Williams opposed Penn Station Access on agency turf grounds. But they rarely have the will to do so. Coordination and good government are not their top priorities. American politicians who are ambitious enough to embark on big infrastructure projects govern their respective states and cities like comets, passing by quickly while expecting to move on to a bigger position within a few years. They can build better institutions if they want, but don’t care to. This goes beyond individual high-profile politicians. In planning for the NEC Future project, a planner who spoke to me on condition of anonymity said that there was an unspoken assumption that there must not be impact to the richest suburbs in Fairfield County, Connecticut; such impact can be reduced, but not eliminated, and to forestall political controversy with very rich suburbs the process left that segment for later, never mind that it is the slowest portion of the Northeast Corridor today outside major city areas. This problem can be mitigated by raising the political cost of poor infrastructure construction decisions. One way to do so is using referendums. In Switzerland, all major infrastructure construction must be approved by referendum. Thus, if cost overruns occur, the state must return to the people and explain itself in asking for more money. In contrast, California High-Speed Rail went to ballot on $9 billion (plus $950 million for connecting transit) out of a budget that at the time was estimated at $42 billion in year-of-construction dollars. The state did not need to identify funding sources for the remaining $33 billion, and thus there was no incentive to control costs, as it was not possible to complete the project for the budget on hand no matter what. The eight above factors all explain why American infrastructure costs are higher than in the rest of the world, and also explain high costs in some other countries, especially Canada. However, one question remains: how come Americans aren’t doing anything about it? The answer, I believe, has to do with American incuriosity. Incuriosity is not merely ignorance. Ignorance is a universal trait, people just differ in what they are ignorant about. But Americans are unique in not caring to learn from other countries even when those countries do things better. American liberals spent the second Bush administration talking about how health care worked better in most other developed countries, but displayed no interest in how they could implement universal health care so that the US could have what everyone else had, even when some of these countries, namely France and Israel, had only enacted reforms recently and had a population of mostly privately-insured workers. In contrast, they reinvented the wheel domestically, coming up with the basic details of Obamacare relying on the work on domestic thinktanks alone. The same indifference to global best practices occurs in education, housing policy, and other matters even among wonks who believe the US to be behind. This is not merely a problem in public policy. In the private sector, the same problem doomed the American auto industry. American automakers have refused to adopt the practices of Japanese and German competitors even after the latter produced small cars better suited for post-1973 oil prices. They instead dug in, demanded and got government protection, and have been in effect wards of the American federal government for about 40 years. American business culture does not care much for imitation, not does American society give high prestige to people who perfect something that someone else invented. The industry that teaches how to adopt best practices, consulting, has poor reputation in American culture. Instead, Americans venerate founders and innovators, an approach that works in industries where the US is in the global frontier, like tech or retail, but not in ones where it lags, like cars and the entire public sector. To avoid learning from others, Americans end up believing in myths about what is and isn’t possible: they insist they are so much richer than Europe that they have nothing to learn from across the Pond, and hang all their hopes on any flim-flam artist who comes from within American business culture who insists there is no real need for public transit or any of the other things Europe and high-income Asia do better. In transit, we see it in politicians and agency officials who say things that are so funny they are sad, or perhaps so sad they are funny. Richard Mlynarik tells me of an official at either Caltrain or the California High-Speed Rail Authority, I forget which, who did not know Germany had commuter trains. Another Caltrain official, confronted with the fact that in Japan trains turn faster than Caltrain thought possible, responded “Asians don’t value life the way we do” – never mind that Japan’s passenger rail safety per passenger-km is about 1.5 orders of magnitude better than the US’s. In stonewalling about its safety regulations, since positively reformed, an FRA official insisted American trucks are heavier than European ones, where in fact the opposite is the case. Boston’s sandbagged North-South Rail Link process included a best practices section but insisted on only including North American examples, since European ones would make America look bad. To advocate for transit among Americans is to constantly hear things are not possible that in fact happen in various parts of Europe on a daily basis. Canada is not much better than the US. Americans’ world is flat, with its corners in Boston, Seattle, San Diego, and Miami. Canadians’ world includes the United States and Canada, making it flat with the northern ends of the quadrilateral stretched a few hundred kilometers to the north. A study of a long-overdue extension of Vancouver’s Millennium Line to UBC has four case studies for best practices, all from within North America. This is despite the fact that in the developed world the system most similar to Vancouver’s SkyTrain in technology and age is the Copenhagen Metro, whose construction costs are one half as high as those of Vancouver despite cost and schedule overruns. Meiji Japan sent students to the West to assimilate Western knowledge and catch up, avoiding the humiliations inflicted upon China in the same era and instead becoming a great power itself. The historian Danny Orbach, who wrote his dissertation on the historical arc leading from the Meiji Restoration to Japan’s World War Two atrocities, argues that Japan was able to modernize because it understood early that it was not at the center of the world, whereas China and the Ottoman Empire did not and thus only realized they were technologically inferior to the West too late, at the signing of the unequal treaties or at dismemberment. The United States at best thinks it’s the center of the world and at worst thinks it’s the only thing in the world, and this has to change. The answer is absolutely. There are no examples of good transit under construction in the United States, but there are many partial successes. The California State Rail Plan is moving toward coordinated planning, and Massachusetts has some inklings of reform as well. Boston’s ability to restart the Green Line Extension is to be commended, and the large gap in cost between the original project and the current one should encourage other American transit agencies to hire good project managers with a track record and pay them competitively; paying high six figures to a manager or even more can easily justify itself in ten-figure savings. The legal problems can be reformed as well without turning the United States into something it is not. Politicians would have to be more courageous in telling constituents no, but so many of them have no chance of losing reelection that they can afford to piss off a small proportion of the population. Contracts could include itemized costs to control change orders. California already awards contracts based on a mix of cost and a technical score, it just needs to adjust the weights and figure out how to avoid doing business with Ron Tutor, and if possible prosecute him. However, all of this depends on solving the last of the above nine problems. Americans have to understand that they are behind and need to imitate. They can try to innovate but only carefully, from a deep understanding of why things are the way they are in such global transit innovation centers as Spain, South Korean, Japan, Switzerland, and Sweden. They have to let go of the mythology of the American entrepreneur who does not listen to the experts. They can solve the problem of high construction costs if they want, but they need to first recognize that it exists, and that internal politics and business culture are part of the problem rather than the solution. I was reticent to post about this topic; I polled it on Patreon in December and it got just under 50% while the two topics I did blog, difficult urban geography and cross-platform transfers, got 64% and 50% respectively. However, between how close the vote was and the conversation about the current state of the subway in New York, I felt obligated to explain what’s been going on. The short version is that practically the entire change in subway ridership in New York over the last generation or two has come from the off-peak, and the way American cities set their frequency guidelines off-peak amplify small changes in demand, so that a minor setback can lead to collapse and a minor boost can lead to boom. The good news is that by setting frequency to be high even if it does not look like ridership justifies it, cities can generate a virtuous cycle on the upswing and avoid a vicious one on the downswing. However, it requires the discipline to run good service even in bad times, when bean counters and budget cutters insist on retrenchment. The Chainsaw Al school of management looks appealing in recessions or when ridership is falling, and this is precisely when people who run transit agencies must resist the urge to cut frequency to levels that lead to a positive feedback loop wrecking the system. The key to the frequency-ridership spiral is that cutting frequency on transit makes it less useful to passengers, since door-to-door trip times are longer and less reliable. The size of this effect can be measured as the elasticity of ridership with respect to service: if increasing service provision by 1% is demonstrated to raise ridership by e%, we say that the elasticity is e.
In a classical TRB paper, Armando Lago, Patrick Mayworm, and Matthew McEnroe look at data from several American cities as well as one British one, disaggregating elasticity by frequency, mode (bus or commuter rail), and period (peak or off-peak). The aggregate average value is e = 0.44 for buses and e = 0.5 for commuter rail, but when frequency is better than every 10 minutes, e = 0.22 on average. Todd Litman of the advocacy organization VTPI has a summary mostly about fare elasticity but also service elasticity, suggesting e is in the 0.5-0.7 range in the short term and in the 0.7-1.1 range in the long term. A paper by Joe Totten and David Levinson includes its own lit review of several studies, including the two above, finding a range of 0.3 to 1.1 across a number of papers, with the lower figures associated with urban service and the higher ones with low-frequency suburban service. The paper’s own research, focusing on transit in Minneapolis, finds that on weekdays, e = 0.39. One factor that I have unfortunately not seen in the papers I have read is trip length. Frequency is more important for short trips than long ones. This is significant, since when the headway is shorter relative to in-vehicle trip time we should expect lower elasticity with respect to the headway. Waiting 10 minutes rather than 5 minutes for an hour-long trip is not much of an imposition; waiting 30 minutes rather than 15 for the same trip is a greater imposition, as is waiting 10 minutes rather than 5 for a 20-minute trip. In New York, the average unlinked subway trip is 13.5 minutes long, so the difference between 10 and 5 minutes is very large. Lago-Mayworm-McEnroe cite research saying passengers’ disutility for out-of-vehicle time is 2-3 times as large as for in-vehicle time; the MTA’s own ridership screen states that this penalty is 1.75, the MBTA’s states that it is 2.25, and a study by Coen Teulings, Ioulina Ossokina, and Henri de Groot says that it is 2 in the Netherlands. Figuring that this penalty is 2, the worst-case scenario for off-peak weekday wait time in New York, 10 minutes, has passengers spending more perceived time waiting for the train than riding it, and even in the average case, 10/2 = 5 minutes, it is close. In that case, higher values of e are defensible. Lago-Mayworm-McEnroe have less data about in-vehicle time elasticity and do not attempt to aggregate in- and out-of-vehicle time. But adding everything together is consistent with e = 0.8 relative to speed averaged over the total wait and in-vehicle time, and then e is maybe 0.4 relative to frequency. If the elasticity of ridership relative to frequency is 0.4, then cutting service by 1% means cutting ridership by 0.4%. If half the operating costs are covered by fares, then revenue drops by 0.2% of total operating expenses, so the 1% cut only saves 0.8% of the total subsidy. Achieving a 1% cut in operating costs net of fare revenue thus requires a 1.25% cut in service, which reduces ridership by 0.5%. This may not sound too bad, but that’s because the above analysis does not incorporate fixed costs. Rail comes equipped with fixed costs for maintenance, station staffing, rolling stock, and administration, regardless of how much service the agency runs. Lisa Schweitzer uses this fact to defend Los Angeles’s MTA from my charge of high operating costs: she notes that Los Angeles runs much less service than my comparison cases in the US and Europe and thus average cost per train-km is higher even without undue inefficiency. In contrast, bus costs are dominated by driver wages, which are not fixed. New York does not keep a headcount of transit employees in a searchable format – the Manhattan Institute’s See Through New York applet helps somewhat but is designed around shaming workers who make a lot of money through overtime rather than around figuring out how many people work (say) maintenance. But Chicago does, and we can use its numbers to estimate the fixed and variable costs of running the L.
The CTA has somewhat more than 10,000 workers, split fairly evenly between bus and rail. The rail workers include about 800 working for the director of maintenance, working on the rolling stock, which needs regular servicing and inspections regardless of how often it’s run; 550 working for facilities maintenance; (say) 400 out of 800 workers in administrative capacity like communications, general counsel, purchasing, and the chief engineer’s office; 600 workers in power and way maintenance; nearly 1,000 customer service agents; and 450 workers in flagging, switching, and the control towers. Only 500 workers drive trains, called rapid transit operators or extra board, and there may charitably be another 200 clerks, managers, and work train operators whose jobs can be cut if there is a service cut. A service cut would only affect 15% of the workers, maybe 20% if some rolling stock maintenance work can be cut. In New York the corresponding percentage is somewhat higher than 15% since trains have conductors. Train operators and conductors together are about 13% of the NYCT headcount, so maybe 20% of subway employees, or 25% with some extra avoidable maintenance work. What this means is that achieving a 2% cut in subsidy through reducing service requires a service cut of much more than 2%. If only 25% of workers are affected then, even without any frequency-ridership elasticity, the agency needs to cut service by 8% to cut operating costs by 2%. The combination of elasticity and fixed costs means that rail ridership responds wildly to small shocks to ridership. For a start, if the agency cuts service by 1%, then operating costs fall by 0.25%. Ridership falls by 0.4%, and thus revenue also falls by 0.4%, which is 0.2% of total operating costs. Thus operating costs net of revenue only fall by 0.05%. The only saving grace is that this is 0.05% of total operating costs; since by assumption fare revenue covers half of operating costs, this saves a full 0.1% of the public subsidy. Read the above paragraph again: taking fixed costs and elasticity into account, cutting service by 1% only reduces the public subsidy to rail service by 0.1%. A 2% cut in subsidy in a recession requires a brutal 20% cut in service, cutting ridership by 8%. And this only works because New York overstaffs its trains by a factor of 2, so that it’s plausible that 25% of employees can be furloughed in a service cut; using Chicago numbers this proportion is at most 20%, in which case revenue falls one-to-one with operating costs and there is no way to reduce the public subsidy to rail operations through service cuts. Of course, this has a positive side: a large increase in service only requires a modest increase in the public subsidy. Moreover, if trains have the operating costs of Chicago, which are near the low end in the developed world, then the combined impact of fixed costs and elasticity is such that the public subsidy to rapid transit does not depend on frequency, and thus the agency could costlessly increase service. This is relevant to the Uber effect – namely, the research arguing that the introduction of ride-hailing apps, i.e. Uber and Lyft, reduces transit ridership. I was skeptical of Bruce Schaller’s study to that effect since it came out two years ago, since the observed reduction in transit ridership in New York in 2016 was a large multiple of the increase in total taxi and ride-hailing traffic once one concentrated on the off-peak and weekends, when the latter rose the most. But if small shocks to ridership are magnified by the frequency-ridership spiral, then the discrepancy is accounted for. If a shock cuts ridership by 1%, which could be slower trains, service disruptions due to maintenance, or the Uber effect, then revenue falls 1% and the subsidy has to rise 1% to compensate. To cover the subsidy through service cuts requires a 10% cut in service, further cutting ridership by 4%. The above analysis is sobering enough. However, it assumes that service cuts and increases are uniformly distributed throughout the day. This is not the actual case for American transit agency practice, which is to concentrate both cuts and increases in the off-peak. Unfortunately, cuts in off-peak service rather than at rush hour do not touch semi-fixed labor costs. The number of employees required to run service is governed by the peak, so running a lot of peak service without off-peak service leads to awkward shift scheduling and poor crew utilization. Higher ratios of peak to base frequency correlate with lower total service-hours per train driver: in addition to the examples I cite in a post from 2016, I have data for Berlin, where the U-Bahn’s peak-to-base ratio is close to 1, and there are 829 annual service-hours per driver. I discussed the fact that the marginal cost of adding peak service is several times that of adding off-peak service in a post from last year. However, even if we take rolling stock acquisition as a given, perhaps funded by a separate capital plan, marginal crew costs are noticeably higher at the peak than off-peak. In New York, the rule is that off-peak subway frequency is set so that at the most crowded point of each route, the average train will be filled to 125% seated capacity; before the round of service cuts in 2010 this was set at 100%, so the service cut amounted to reducing frequency by 20%. The only backstop to a vicious cycle is that the minimum frequency on weekdays is set at 10 minutes; on weekends I have heard both 10 and 12 minutes as the minimum, and late at night there is a uniform 20-minute frequency regardless of crowding. Peak frequency is governed by peak crowding levels as well, but much higher crowding than 125% is permitted. However, the busiest lines are more crowded than the guidelines and run as frequently as there is capacity for more trains, so there is no feedback loop there between ridership and service. The saving grace is that revenue is less sensitive to off-peak ridership, since passengers who get monthly passes for their rush hour trips ride for free off-peak. However, this factor requires there to be substantial enough season pass discounts so that even rush hour-only riders would use them. Berlin, where U-Bahn tickets cost €2.25 apiece in bundles of 4 and monthly passes cost €81, is such a city: 18 roundtrips per month are enough to justify a monthly. New York is not: with a pay-per-ride bonus a single ride costs $2.62 whereas a 30-day pass costs $121, so 23.1 roundtrips per month are required, so the breakeven point requires a roundtrip every weekday and every other weekend. The subway’s crisis in the 1970s reduced ridership to less than 1 billion, a level not seen since 1918. This was on the heels of a steady reduction in ridership over the 1950s and 60s, caused by suburbanization. In 1991, ridership was down to 930 million, but the subsequent increase in reliability and fall in crime led to a 24-year rally to a peak of 1,760 million in 2015. Throughout this period, there was no increase in peak crowding. On the contrary. Look at the 1989 Hub Bound Report: total subway ridership entering Manhattan south of 60th Street between 7 and 10 am averaged about 1 million, down from 1.1 million in 1971 – and per the 2016 report, the 2015 peak was only 922,000. 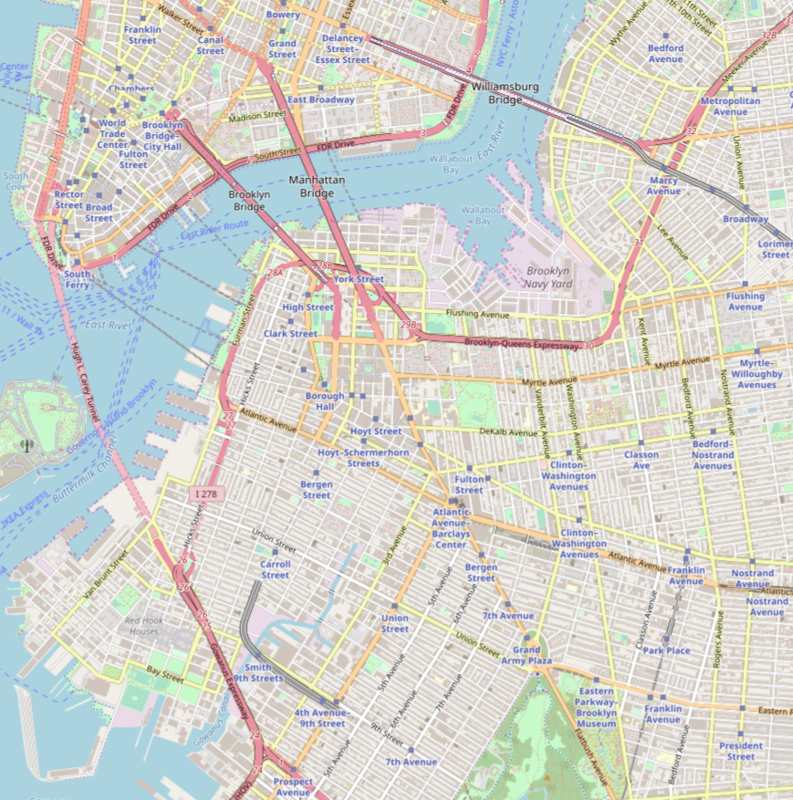 Between 1989 and 2015, NYCT actually opened a new route into Manhattan, connecting the 63rd Street Tunnel to the Queens Boulevard Line; moreover, a preexisting route, the Manhattan Bridge, had been reduced from four tracks to two in 1986 and went back to four tracks in 2004. Nor was there much of an increase in mode share. The metropolitan statistical area’s transit mode share for work trips rose from 27% in 2000 to 30% in 2010. In the city proper it rose from 52% in 1990 to 57% in 2016. No: more than 100% of the increase in New York subway ridership between 1991 and 2015 was outside the peak commute hours, and nearly 100% of it involved non-work trips. These trips are especially affected by the frequency-ridership spiral, since frequency is lower then, and thus a mild positive shock coming from better maintenance, a lower crime rate, and perhaps other factors translated to a doubling in total ridership, and a tripling of off-peak ridership. Conversely, today, a very small negative shock is magnified to a minor crisis, even if ridership remains well above the levels of the 1990s. Managers like peak trains. Peak trains are full, so there’s no perception of wasting service on people who don’t use it. Managers also like peak trains because they themselves are likelier to ride them: they work normal business hours, and are rich enough to afford cars. That current NYCT head Andy Byford does not own a car and uses the city’s transit network to get around scandalizes some of the longstanding senior managers, who don’t use their own system. Thus, the instinct of the typical manager is to save money by pinching pennies on off-peak service. In contrast, the best practice is to run more service where possible. In Berlin, nearly all U-Bahn trains run every 5 minutes flat; a few lines get 4-minute peak service, and a few outer ends and branches only get half-service, a train every 10 minutes. At such high frequency, the frequency-ridership spiral is less relevant: an increase to a train every 4 minutes would require increasing service by 25%, raising costs by around 5% (Berlin’s one-person crews are comparable to Chicago’s, not New York’s), but not result in a significant increase in ridership as the shorter headway is such a minute proportion of total travel time. However, New York’s 10-minute off-peak frequency is so low that there is room to significantly increase ridership purely by running more service. In 2015 I criticized the frequency guidelines in New York on the grounds of branching: a complexly branched system must run interlined services at the same frequency, even if one branch of a trunk line is somewhat busier than the other. However, the frequency-ridership spiral adds another reason to discard the current frequency guidelines. All branches in New York should run at worst every 6 minutes during the daytime, yielding 3-minute frequency on most trunks, and the schedules should be designed to avoid conflicts at junctions; non-branching trunk lines, that is the 1, 6, 7, and L trains, should run more frequently, ideally no more than every 4 minutes, the lower figure than in Berlin following from the fact that the 1 and 6 trains are both local and mostly serve short trips. Moreover, the frequency should be fixed by a repeating schedule, which should be clockface at least on the A train, where the outer branches would only get 12-minute frequency. If ridership increases by a little, trains should be a little more crowded, and if it decreases by a little, they should be a little less crowded. Some revision of schedules based on demand may be warranted but only in the long run, never in the short run. Ideally the system should aim at 5-minute frequency on every route, but as the N, R, and W share tracks, this would require some deinterlining in order to move more service to Second Avenue. This increase in frequency is not possible if politicians and senior managers respond to every problem by cutting service while dragging their feet about increasing service when ridership increases. It requires proactive leadership, interested in increasing public transit usage rather than in avoiding scandal. But the actual monetary expense required for such frequency is not large, since large increases in frequency, especially in the off-peak, mostly pay for themselves through extra ridership. The initial outlay required to turn the vicious cycle into a virtuous one is not large; all that is required is interest from the people in charge of American transit systems.